If you are looking for work, consider temporary employment a valuable source of job opportunities. As a temp, you can increase job skills and work experience, expand business networks, strengthen your resume, and avoid gaps in employment, all while being paid. Quite often, temp work can be a “job audition” because it puts temps in front of hiring managers and decision makers for days, weeks, or even months at a time while on job assignments. 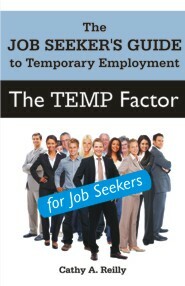 The Temp Factor for Job Seekers: The Job Seeker's Guide to Temporary Employment presents how this job search strategy may get you back to work faster. Becoming a temp guarantees what a resume cannot: face time inside the doors of potential employers. With over 20 years of experience working with staffing service firms and temps, Cathy A. Reilly teaches you about the advantages, challenges, pay, and benefits of being a temp. She explains what clients and staffing services look for in effective temps, how to find and apply to a high quality staffing service, and how to distinguish yourself from the crowd. Corporate culture, job performance issues, temp assessment tools, interview questions (and answers that have impact), real-world insights and “must knows” are included in this comprehensive manual. You may also be interested in The Temp Factor: The Complete Guide to Temporary Employment for Staffing Services, Clients, and Temps by Cathy A. Reilly. Cathy Reilly holds a degree in Business Administration and has worked for over 20 years in human resources and management at various companies in sectors coast to coast. Her career began in the U.S. Navy and led to work in the private sector industries of law, hospitality and entertainment. For the past 15 years, Cathy has worked in the financial services area of Wall Street and presently holds a position as Director of Administration at a private equity firm in Manhattan.